1. Remove the oil pump (see page 8-17). 2. Remove the baffle plate (see step 8 on page 7-14). 3. Remove the oil jet bolts (A), then remove the oil jets (B). 4. Carefully install the oil jets, and tighten the oil jet bolts. 5. Install the baffle plate (see step 25 on page 7-29). 6. 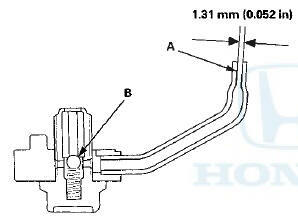 Install the oil pump (see page 8-23). 1. Remove the oil jet (see page 8-14), and inspect it as follows. - Make sure that a 1.2 mm (0.05 in) diameter drill will go through the nozzle hole (A) (1.31 mm (0.052 in) diameter). - Insert the other end of a 1.9 mm (0.07 in) drill into the oil intake (2.0 mm (0.079 in) diameter). Make sure the check ball (B) moves smoothly and has a stroke of about 2.0 mm (0.079 in). - Check the oil jet operation with an air nozzle. It should take at least 325 kPa (3.9 kgf/cm2,47psi) to unseat the check ball. NOTE: Replace the oil jet assembly, if the nozzle is damaged or bent. 2. Carefully install the oil jet. The mounting torque is critical.